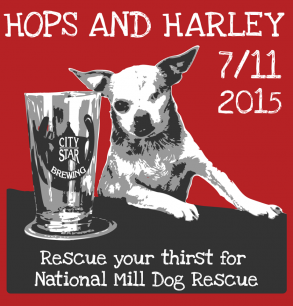 For the 3rd year in a row, City Star Brewing has stepped up to help a little Chihuahua named Harley spread the message about puppy mills and raise money for National Mill Dog Rescue. BERTHOUD, Colo. - July 22, 2015 - PRLog -- Harley spent 10 years living in a small cage in a puppy mill, never knowing the touch of a kind hand … until he was rescued and found a loving home. City Star Brewing, located in Berthoud, Colorado, learned the plight of the puppy mill dogs through Harley and then ‘Hops and Harley’ became a reality. Each year this event becomes more popular. This year’s attendance this reached over 1,800 people and raised more than $14,000 for the Colorado Springs based non-profit. ‘Hops and Harley’ took place in Fickel Park in beautiful downtown Berthoud, just 3 blocks west of City Star Brewing. There was live music, food trucks, a silent auction, activities for the entire family (including the dogs), a photo booth, puppy mill education, great beer and more! Harley was there making the rounds, meeting his fans and sharing the message, Adopt, Don’t Shop! A couple of new events this year was a dog agility course and a doggie doppelganger contest … and to everyone’s surprise, a young couple even became engaged onstage! Main sponsors of 'Hops and Harley' were: Go West T-Shirt Company, Mueller and Associates CPA, The Barrel Beer Garden, Smokin' Daves BBQ, Alpha Graphics, and of course, City Star Brewing. Harley tells his story on his facebook page which currently has nearly 68,000 fans. His campaign, “Harley to the Rescue” has raised more than $500,000 for National Mill Dog Rescue to date. City Star Brewing is not only known for its generosity, but also for great beer; as evidenced by their Gold and Bronze medals which they were awarded at the world renowned, Great American Beer Fest in 2013. Since then they've won other medals including a silver and bronze in 2014 and 2015 for 'Harley's Honey Wheat', named after Harley! This small town brewery first opened its doors just over 3 years ago and has since become a destination for craft beer lovers.